Is there anything tastier than a lovely slice of crispy BACON? The answer in this house would be "NO!" 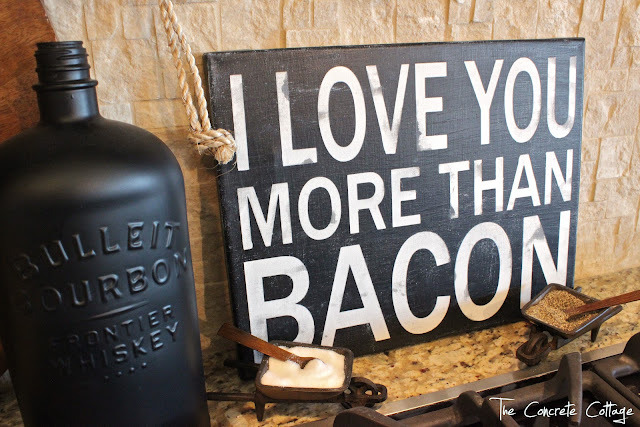 I've always been a fan of bacon, but my kids... they are a teensy bit obsessed. They have it as an afternoon snack. They fight again cuz one of them didn't remember it in the fridge and missed the afternoon snack. I'm pretty sure one or two of them even has a t-shirt devoted to it. So with this much bacon love in the house, the day I spotted a sign saying "I Love You More Than Bacon" it took about 0.2 seconds to decide I would be making it. I mean, loving more than bacon?? I used the same basic steps to create this sign as I did when I made my Latitude/Longitude signs (you can find that tutorial HERE), with only a few notable differences. Instead of using wood, I purchased an 11x14 painters canvas from Michael's. They're cheap and I didn't have to paint a white base coat since they come pre-primed in white. Since I wasn't painting a base coat though, I decided to use Mod Podge to go over the vinyl and seal the edges. I got the exact same results that I do with paint, NO BLEEDING under the vinyl! After painting over the vinyl with basic black, I removed the vinyl and attempted to give it a worn out, aged look. I slopped on a very watered down black paint and hit it with a hair dryer. You've figured out I'm impatient, right? My final step consisted of adding just an teensy tad of white. And when I say a tad, I mean it. It added just enough white to make me happy and BONUS, gave it a hint of a chalkboard look. 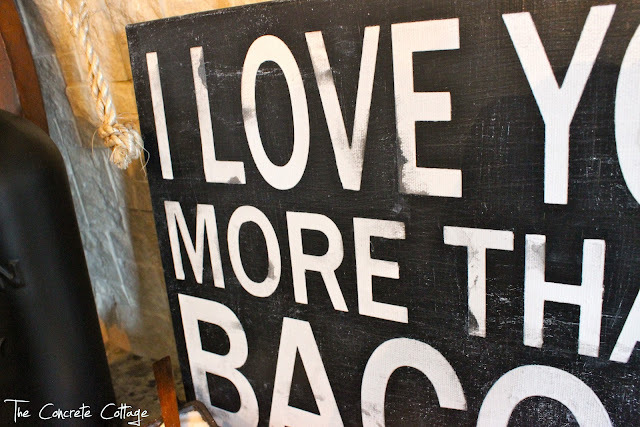 My Lovey Dovey Bacon sign that only took about two short hours to complete. And hey, this week is Valentine's Day. My sign has the word "love" in it. I can almost pretend that I did that on purpose and call this a Valentine's Day post. The idea of me being on top of things enough to intentionally create a project for any other holiday than Christmas is simply absurd! Y'all know me better than that by now... right? 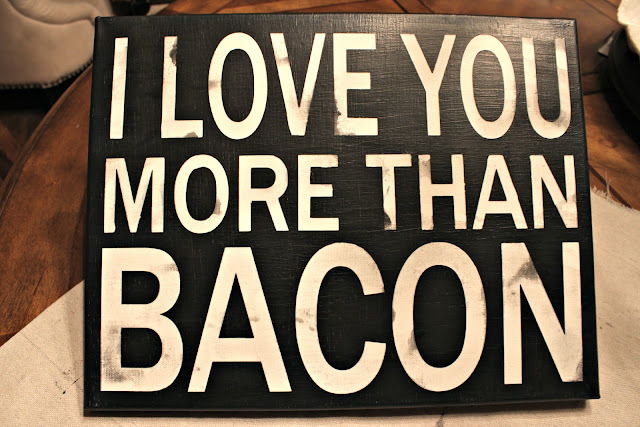 I love bacon, if you ever need a good laugh look up Jim Gaffigan's bacon comedy on youtube, it's one of my favorite things ever. Your canvas is awesome. I've been wanting to do something like this with canvas... Pinning this so I remember the step about Mod Podge! Love it!!! My family would too!!!! Bacon is a pretty hot commodity around here too, so I totally get your sign. Great idea to use the canvas this time, and I'm glad you mentioned about the Mod Podge on top of the vinyl letters. I always forget about that step. It wouldn't have occurred to me to use Mod Podge...I would have been scrambling to find a matching white paint. 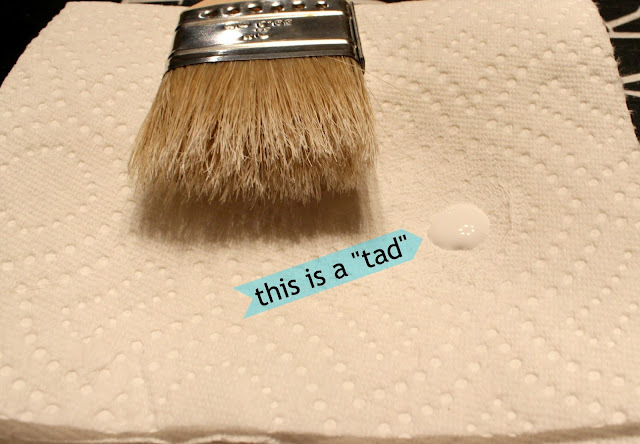 For that matter, you could use Mod Podge for any color base, couldn't you? I am definitely going to have to remember that. Love that you went back over it with the dry brush....you're right. It does give it a sort of chalk board look. Love it! Great job, as always! I'm going to have to do a bacon sign. It will be perfect for my daughter. She'll be thrilled. I may just make a little one though. Not sure, but I love the saying and she'll totally love it. 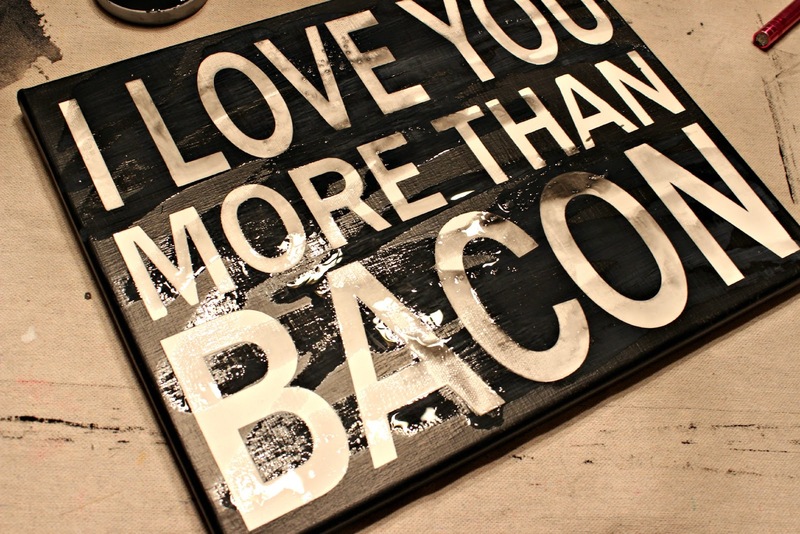 This is so cute.. And when you say you love something more than bacon.. that means a WHOLE LOT!!! Love this - thanks for the great tutorial. I'll have to give it a try. This turned out great. I love the saying, love the sign. Nice tutorial, thanks. This is great and it made me laugh! I love that saying. I want to make a t-shirt with that one it! Ha ha! The phrase on this sign makes me smile. My husband has said to me before, "I love you more than surfing." And perhaps my response should be, "I love you more than crafting." ;-) Thanks for the inspiration here today. Pinning this project fo' sho'. This is too cute!! Love the salt and pepper in the little wheelbarrows. My husband would love this! He's a big pig product lover. What a great tutorial. I love bacon. It does not love me. But this sign is so cute for the kitchen. Love it! 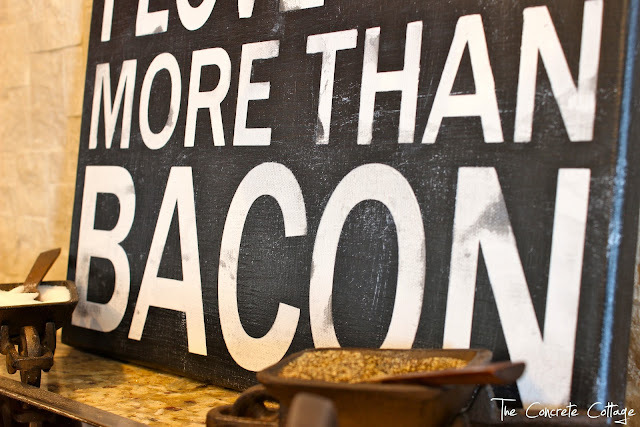 love the bacon sign. thanks for sharing your tutorial. Very cool...same obsession on this side of the family. Pathetic that you posted this Sunday and I'm just now seeing it. Shows just how much I'm paying attention. Loved the watered down black technique with the driest dry brushing!!! I always go way too overboard with my dry brushing. One year we gave up BACON for New Years' and the following year when setting this annual family resolution my son said "this year we should eat all the bacon we can get our hands on!". We did and it was good. This is AWESOME!!! I might have to borrow this and make it for my best guy friend. He would think it's awesome too. Thanks for sharing! When I saw this at a linky party, I had to laugh because the card my husband gave me for Valentine's day said this same thing! Your finished project is awesome. HAHAHAHA this is awesome! I just made a vday card for my hubby that said "i love you more than cupcakes." 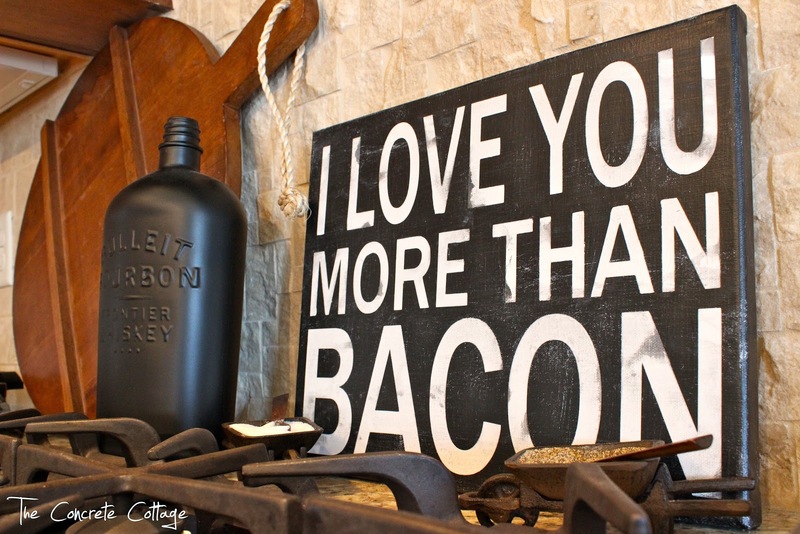 i totally need to make this for his side of the bed! lol! Such a nice visit this afternoon. How fun is that! Totally cool! So funny! Your newest follower. I absolutely love this sign. Thanks for sharing! I should send you a picture of my counters. I think they are twins separated at birth! This is such a cute idea! 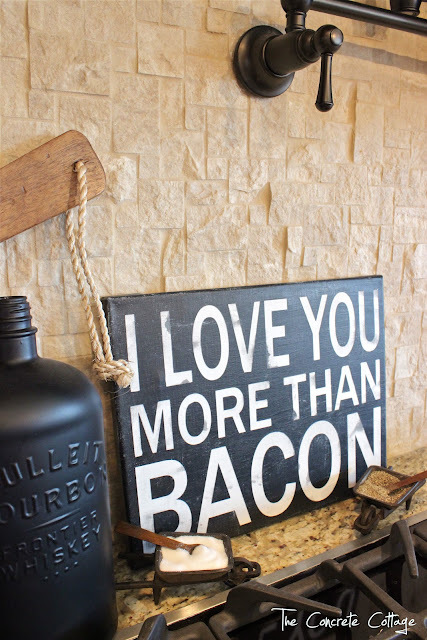 My husband and kids are fixated with bacon, so I can appreciate the sentiment. Love the vintage look of the sign. I have started a new party called 'Saturday Sparks' and would love to have you link up if you get a chance. Your creativity always makes me smile. Fell in love with this the very second I saw it. Around my house, that is a whole lotta love! I can see one of these in my kitchen very soon.Thanks for the inspiration! LOVE this sign!! It's so perfect for us. Thanks for linking up to Think Pink Sunday! I love this sign...so much fun! Love it! I have a follower that currently linked up at my party on how to cook bacon. YOU are the ultimate sign maker! Brilliant techniques! Hello! I stumbled upon your blog when googling for ideas of ways to use my old Bulleit bourbon bottles. I love the way that matte black paint looks on the bottle and was hoping you had a tutorial on that project but didn't see one. Would you mind sharing what type of paint or the technique you used? I would love to do the same thing to my empties. I don't have a tutorial, but I'd be happy to share how I painted the bottle. Very simple, I bought some chalkboard spray paint (I believe at the time I got it at Michael's, but it's now available all over) and just gave it a few coats of that. Truly, that's all their was to it. Hope that helps! Thanks! I had a feeling that's what you used, I appreciate you sharing the info. Looks like I've got a new project to do!